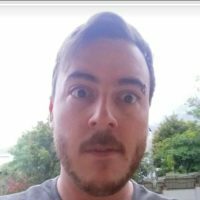 OpenAI is a nonprofit tech company co-founded and backed by the South African billionaire tech giant, Elon Musk. The company is tasked with creating an Artificial Intelligence program with the sole purpose of mastering the game of Dota 2 and beating human players at one of the more complex, competitive video games on the market. With Ti8 just a short while away, the OpenAI Five team is ready to benchmark their bots against a human team that includes Blitz, Cap, Fogged, and Merlini. The match will be casted on Twitch by Purge and ODPixel on the 5th of August at 21h30 SAST. You might be wondering why the waste of time and money on a project like this, and the answer is actually rather simple. One of the biggest challenges in designing Artificial Intelligence is scaling up variables. When the tasks are simple, there’s not too much trouble. When tasks become complicated, that’s when the AI starts to struggle. One way to look at it is how many choices are present for any given action. In a game like chess the average amount of moves per game is 40. After each player makes one move the total amount of positions available, or game states, is 400. After two moves each, it becomes 72,084 game states. After three moves each? Over nine million. Let that sink in for a moment. No one knows what the average amount of moves for a game of Dota is, but the average count for OpenAI’s bot is 20,000 moves per game. 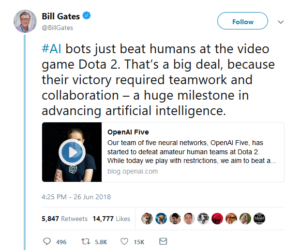 Being able to create a bot that can handle a game like Dota 2 is an astronomical undertaking but if successful it will result in better AI in all future projects, game related or not. After the showcase on the main stage, OpenAI was pitched against anyone who wanted to give it a go at the event. At the time players were heavily limited in what they could do; with rules and limitations on what hero they could play and what actions they could take. By the end of the event the bot had been beaten by many players, both professional and casual, who managed to find weaknesses in what the bot was capable of. While the bot was extremely good at basic mechanical functions, such as last hitting, harassing, and executing its skills, it was not ready to play the full complexity of a 5v5 with all the nuances that Dota 2 has to offer. Is all that about to change? So, is this the year where machines will overthrow even the most stalwart of professional players in a complex, live game? With Ti8 just around the corner, my bet’s on the bot’s getting a second win on the main stage. ABalloon by day and…. Well the same at night. Kirrin frantically runs around applying his knowledge of cooking professionally to the totally related field of esports, masking his self doubts with tasty treats. Also speaks Catsu.